Wanting a loving cat to adopt? 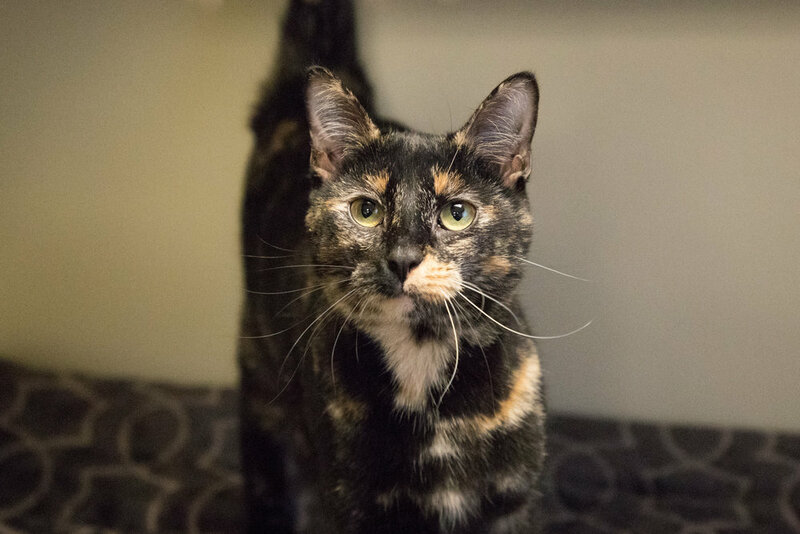 This tortoiseshell female may be what you’re looking for! Ann is an adorable kitten who’s just about a year old. She is very friendly and will easily make herself at home with you. Along with this, Ann also enjoys providing and receiving affection, giving you all the more reason to snuggle with her. Charlotte is a super sweet female cat that you’ll absolutely love! She’s five years old and very charming. She enjoys laying down and being cuddly. You’ll certainly find joy with this adorable cat and she’ll easily adapt as a new member of your home. Chopper is a two-year-old puppy who’ll brighten your world! He’s a shepherd mix and requires lots of attention. This lovable rascal contains lots of energy and he’ll definitely be an absolute delight in your home. He has also already been neutered. Chopper will be a great new addition to your family. Ann is spayed and has a special adoption fee of only $25, Charlotte has an adoption fee of $85 (includes rabies, vaccination, combo shot and microchip) and Chopper has an adoption fee of $45. Want to give Ann, Charlie or Chopper a home? Please contact Officer Terra Rose at 972-468-4226 or trose@murphytx.org. Stop by for a visit at Murphy Animal Control Shelter located at 205 N. Murphy Road (behind old City Hall). They are open Monday through Friday from 8 a.m. to 5 p.m. Adopt today! Ann’s adoption fee is $25. Chopper is a lovable rascal. Oct 22 New Pets That You’ll Paw-sitively Love!